The SLF promotes literary quality in speculative fiction, by encouraging promising new writers, assisting established writers, facilitating the work of quality magazines and small presses in the genre, and developing a greater public appreciation of speculative fiction. Learn more at www.speclit.org. This charming tale, written by Amirthi Mohanraj and illustrated by Kat Beyer, is the story of a young poet who sets out on a journey to find poetry. With the guidance of two ravens, the help of a few magical creatures, and a strong dose of determination, the young poet adventures in the wide world, finding more than she ever expected. Amirthi Mohanraj was born in Colombo, Sri Lanka, and now resides in Chicago with her partner, Kevin, their daughter, Kavya, and their dog, Ellie. 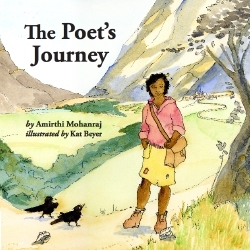 Amirthi has written several books for adults, but this is her first book for children and poets. She hopes you like it. Kat Beyer has drawn and painted since she was two, and now makes a living from her art. She lives in Madison, Wisconsin, with her fiancé, Wolf, her stepdaughter, Rain, and Luna, her favorite dog living. This is the first children's book she's illustrated. She hopes you like it too.